According to reports in Confidencial Colombia, Ronaldo has been an influential factor in convincing midfielder James Rodriguez to stay despite all odds favouring him to leave this January. Chelsea were the club heavily linked with James this month as the prime location for the midfielder to head to, but his recent revival is proof that he will spend further time fighting for his place at Real Madrid. Rodriguez was heard telling reporters he’s ready to stay at Madrid and fight for his place in the first team with the hopes of starting the new year as a new player and new ambitions. James joined Madrid in 2014 after his impressive run in the World Cup convinced Los Blancos to sign him for a fee of £80m. Since then, he has made 29 and 26 La Liga appearances in 2014 and 2015 respectively, but has fallen to 9 appearances this season with 5 being off the bench, clearly not being a favourite in Zidane’s selection policies. 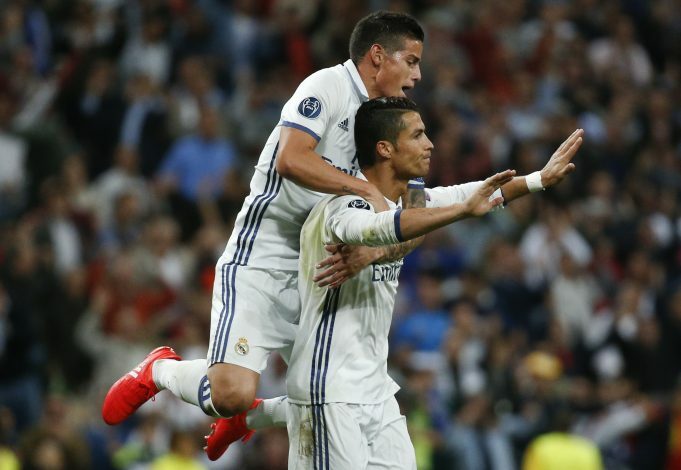 Rumours suggest Jorge Mendes, agent of both Ronaldo and James, played a huge role in convincing James to stay, along with the help of Ronaldo. James has had decent performances this season, but knows and is prepared to raise his game to match Zidane’s expectations and enter a team which is currently on a 39-game unbeaten run. Even if James chose to move to Chelsea, it would be tough finding a spot in the starting XI, with Conte’s men leading the league and firm on their team and current playing style. What happens in the future is to be seen, but a player with Real Madrid will never give up without a fight, and that seems to exactly be the case with James, and Ronaldo might be the one he thanks later in life for convincing him to do so.